I wrote back: "Bulbs...I have a love/hate relationship with them, but would love to give what you send a try — if they pass my test — what I don't like about bulbs is the requirement to let their foliage stick around, turning all brown and ugly. For that reason I don't plant bulbs, unless they're in a container I can hide after the flower show is over. If you've got ideas of bulbs that won't make such a ugly statement as tulip and daffodil foliage typically does then I'm all ears! "...Ya, you offer me something free and I get all persnickety...what can I say I'm a very choosy gardener! I've never planted species tulips and Michelle included quite a few, assuring me their foliage wouldn't be as obnoxious as the others. She also encouraged me to think of "regular, flashy tulips" as annuals (more on that below). And wow! 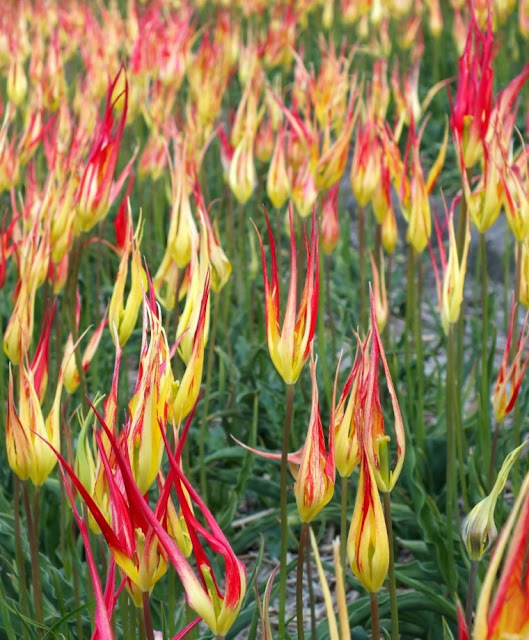 Yes please, Tulipa acuminata is insane, in a good way. BTW, all flower photos included in this post were lifted from the John Scheepers website. I'm sure they won't mind. More species Tulips...25 of them! I am no bulb expert but these just look pristine. The description for Little Beauty says "cherry-red" — was that written for folks like me with an aversion to pink? I think these will be going in the front garden, where the plants I love for their foliage, but insist on blooming pink, live. This is officially more tulips than I've ever planted. And I did go through a tulip phase in my Spokane garden. Little Princess, "a T. hageri and T. aucheriana cross, this dainty, scented beauty is Spanish-orange with a yellow-edged, black center" — I think I'm in love with it from that description alone. But you know what, I forgive her because LOOK! Tulip Rococo is a beauty, this is where her suggestion I treat them as annuals will come into play. Those beauties will definitely be pulled or cut and used in one of my spring In A Vase on Monday posts. 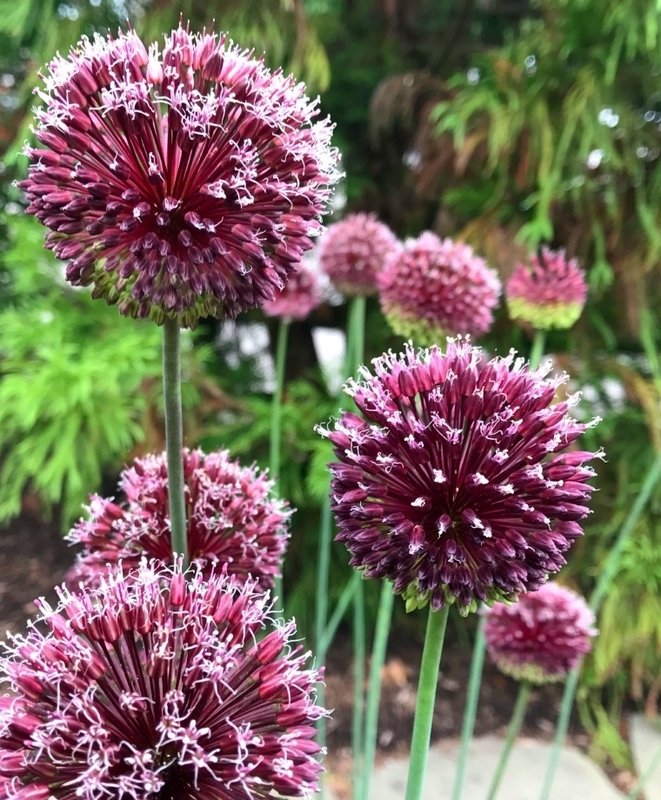 The description for Allium Forelock: "Forelock has 2"- to 3"-wide, globe-shaped flowers that grow to 3" around with an unruly tuft of white-tipped, mahogany-red flowers exploding out of the top of their heads. The wiry stems stage a wild dance of spath-tipped curly cues before gradually almost-straightening out and bursting into bloom from the top to the bottom of their floret-clustered orbs. The flowers first appear round, with green buds on the bottom, then turn totally mahogany-red with star-shaped silvery-white stamens. Its next act reveals the emergence of unruly top tufts after which they slowly transform themselves into seed-pod encrusted sentries." She also tucked in a few Allium schubertii. Yay! I love them, but just haven't taken the allium plunge becasue of the ugly dying foliage. There's no better time to give it a try then when they just show up at your door, right? There was one more bag to open, it had a Christmas-gift worthy feel to it, but there's no way I'm giving it away. Apple-green to chartreuse yellow? Hell ya! 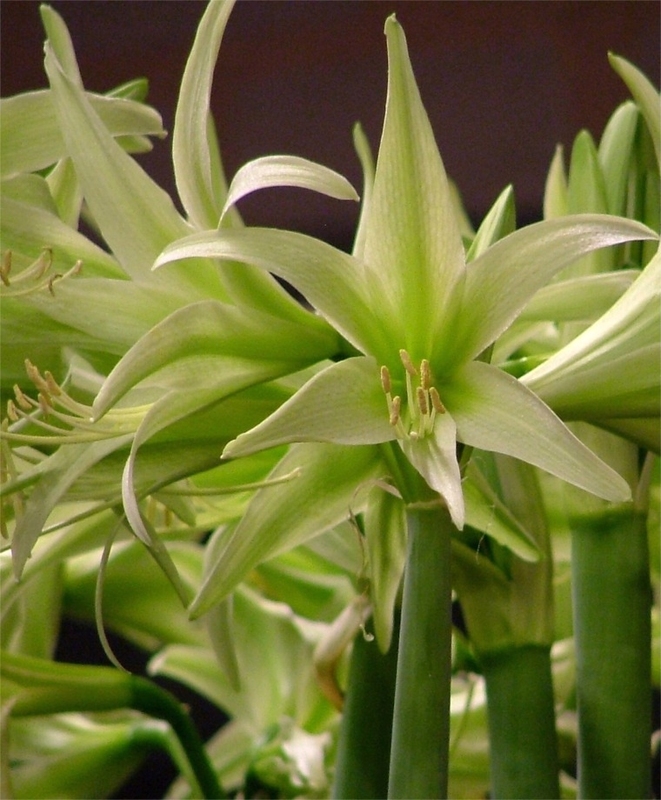 Cybister Amaryllis Evergreen is a knock-out. Perhaps just the push I needed to "plant" a few Amaryllis this year, it's been awhile. So that's my John Scheepers haul, 76 bulbs total that I needed to plant...(thank you Michelle and John Scheepers!). She also included a print-out so I'd remember what they were. Thank you Alison! Rounding out my bulb collection? Ya, I still hadn't planted the crocus bulbs I got back in late October. I've always been a little smug when others talk about all the bulbs they need to get in the ground — "ha! Not me, I don't play that game" — I guess that's come back to bite me, big time. Thankfully last Saturday was a glorious, dry, partly sunny day and these are all in the ground! I've also remembered another issue I have with bulbs. When they say plant them 6-8" deep...do you really dig a hole that deep? Really? Because I don't. Those might have ended up 5" under. I think I cheated a little on the 4-6" too. Hopefully they'll be forgiving. Weather Diary, Nov 19: Hi 51, Low 35/ Precip .18"
To my eye, 'Little Beauty' is, in fact, NOT pink, in fact far less pink than the image you shared implies. It is one of my favorites. Please don't judge me if, when it blooms, you have to rip it out in a pink-hating rage. Your comment gives me hope Joseph, and I promise to refrain from speaking poorly about you, should the pink be overwhelming. I am gree with envy! I love Tulips, they are my absolute favorite flower but unfortunately I can't grow them here with this awful hot climate. Have a great week! I do try to get big bulbs like the largest of those lily bulbs and Alliums at least 6 inches deep, but I think they will be forgiving. 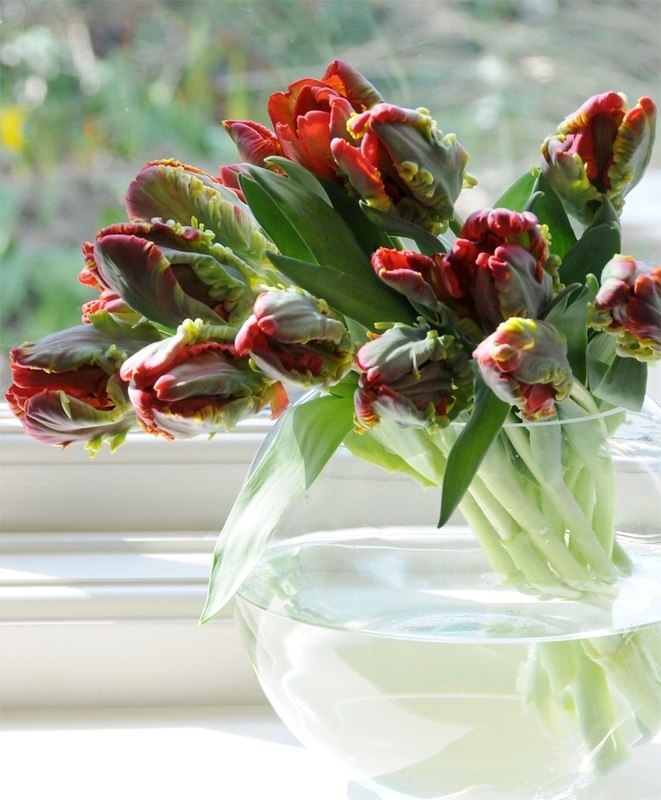 Those Rococo tulips are going to be fabulous in your IAVOM posts. Boy, did you score. I think Michelle used to do the Picture of the Day at Fine Gardening (among probably many other editing chores). I think I was successful with the Lilies, and hopefully the A. schubertii. All the gravel adds a layer of an inch or two, hopefully that will help. I did score, I'm feeling very lucky! Wow, what a haul! I wouldn't say no to that. 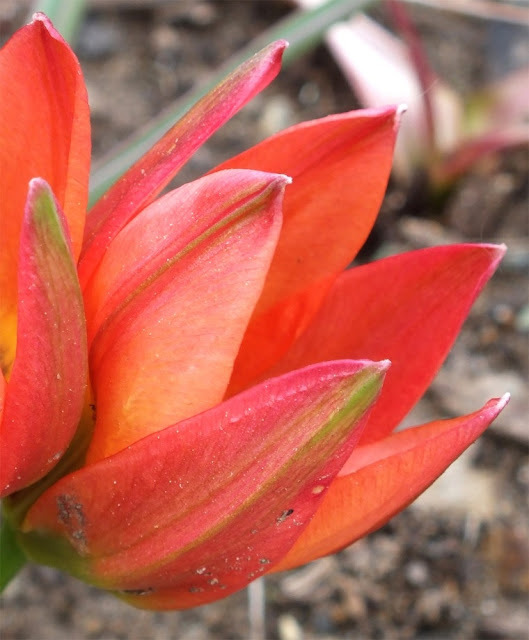 I've planted quite a few South African bulbs but am tempted to try some species tulips. The problem is that tulips often don't come back because it's not cold enough in the winter. I can't wait to see the results of your bulb experiment! So true, Tulips will vanish on me too. So do daffodils here. I’m adding a lot of native bulbs and South Africans also. Bulbs are da bomb though, they add a layer to the garden. Sorry guys...you can plant South African bulbs but Tulips and Daffodils disappear. I shed no tears for you. I do look forward to sharing flowers come spring though! Sweet! I have the same love/hate relationship with bubs (same reasons), but people keep giving them to me. I have friends in Amsterdam, so we shall forever have tulips in our garden as we get a gift box every year. I did fall in love with one species tulip - Tulipa batalinii which is short with glaucus leaves and a soft yellow. Very pretty and low, so the foliage which is awesome is easily covered by surrounding plants - and they are more rock garden tulips. You got some great bulbs, keep the photos coming once they emerge this spring. A gift box of Tulips does not sound like a bad thing, although I do understand the complications. 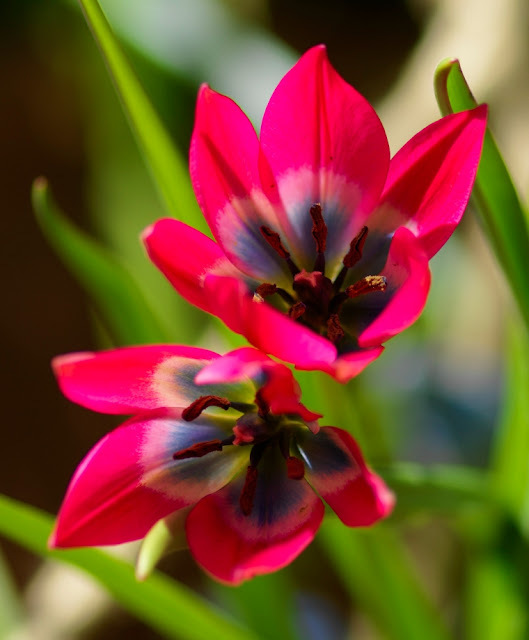 Tulipa batalinii looks like a winner! Last Saturday's weather was a gift for gardeners. I know what you mean about planting depth of bulbs. I cheat a little too, and I wonder what happen after a few years of mulching where the bulbs end up deeper then intended. If the make it, great. If not they are annuals. Tulipa acuminata is stunning. Ah...good point about future mulch, I hadn't even thought about that. Every garden needs a few bulbs. I plant mine near the fence under shrubs so they can die in secret. How nice of Michelle to send these to you. Tulipa acuminata is really special. I can't wait to see photos of yours next spring. I bought some lily, allium and Leucojum. I hate planting bulbs but in spring I'm always glad I took the time to do it. This is truly a leap of faith for me, we'll see how I'm feeling in the spring. You know I'll write all about it. I planted species tulips (tho' not the same ones you received) years ago in my former garden. Amazingly, they did return for me, albeit in ever-decreasing numbers. I went more than a little crazy with bulbs myself this year, planting over 250, the last of which finally went into the ground last week. Some were the usual stalwarts here, like Freesia and Sparaxis, but I also invested in daffodils, Alliums, and Ranunculus. 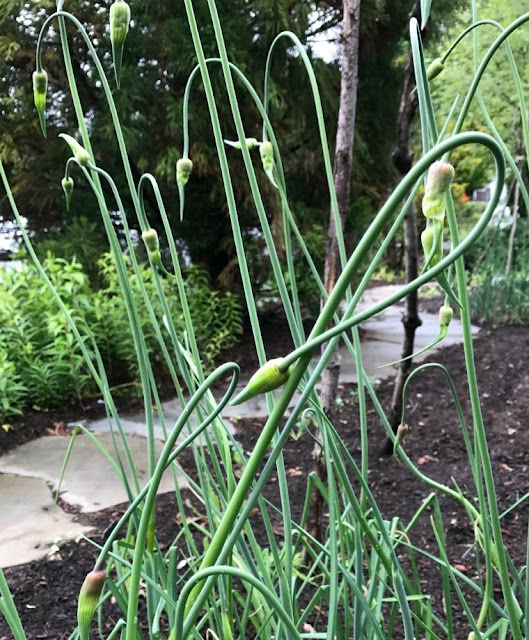 Some, like Ranunculus, can handle our warm weather but they need a surprising amount of water during their growing season. It remains to be seen whether this year's exercise will encourage or discourage future bulb purchases. My biggest challenge thus far has been the digging activity of the squirrels and raccoons. Over 250...good god woman! I wish I could plant Freesia and Ranunculus here, that would make me very happy. I do hear you about the squirrels. I finally had to plant a few remaining bulbs in containers and laid down chicken wire under a fine layer of pea gravel to keep the little turds from digging them all up. They did attack an area under mulch last night. I need to put down another layer and stick some skewers in to keep them out. What a nice surprise! Very impressive that you got them all in the ground. Can't wait to see them all bloom! 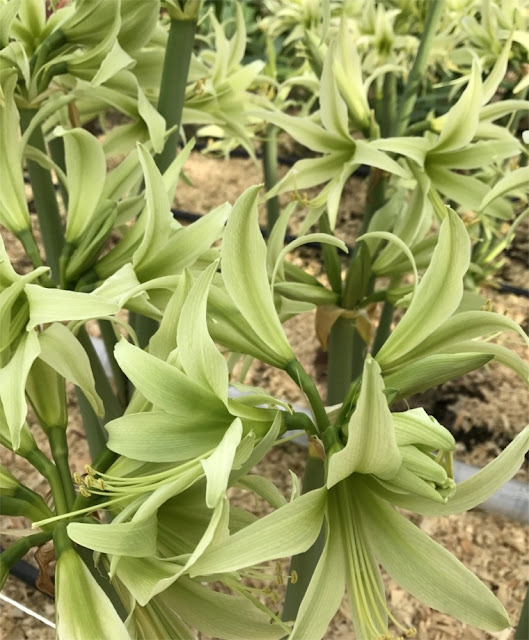 If you plant spring bulbs around hostas or other herbacious plants, their emerging foliage will cover up the dying bulb foliage. I wanted to plant them near my Hostas for that very reason, but I ended up chickening out, worried they wouldn't get enough sun. Planting a whole lot of bulbs is the only way to do it! I agree with you about the foliage issue, but for me the biggest "problem" with them is remembering that they are under there when it's time to plant something else (slice!). 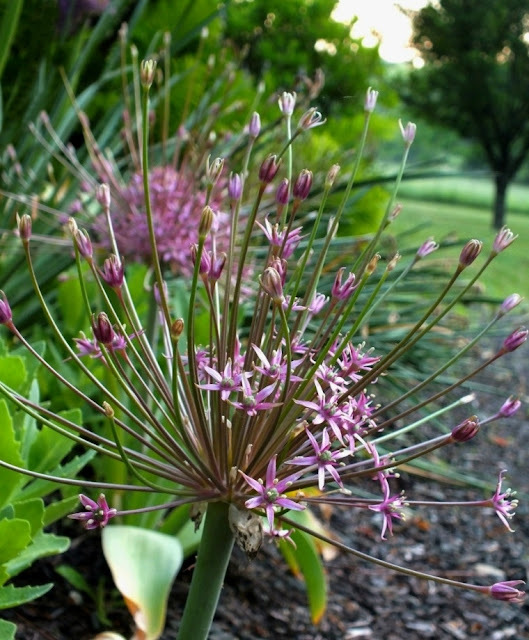 I'll plant Allium without a second thought. That is a problem for me too, but I think (hope) I was successful in tucking them into spots where I won't be digging. Which is part of the problem with planting them as deep as they would like (disturbing roots being a bad thing). Lucky girl! I would be just as picky as you were with them. If you have a cutting bed or a place to trial plants then it's not a problem to get freebies. But I now only accept what I want in my garden. I have been growing Acuminata and Forelock and love them both. I've also done species Tulips and they are little winners. I saw Forever Susan in a friend's garden and this was the first year it bloomed in mine. Now that is one flower that seems meant for you! I so wish I had a cutting garden, how amazing that would be! Thank you for the positive feedback on so many of the things I planted. Truth be told I did start to worry as I was planting..."is this too much?"... "am I going to be annoyed by all these flowers in the spring?... I know, I am a weirdo. What a treasure trove of bulbs Michelle sent to your door... she knows that since you are a discriminating plantswoman you would be the perfect recipient of a boat load of bulbs!!! Like you, I have always had a love/hate relationship with bulbs. The dying foliage annoys me to no end. I once felt guilty ripping off the dead leaves, didn't last long. Consider the tulips annuals. Alliums were my fave until 2 years ago when my 10 bulbs planted 7 years before multiplied to 50-60. Ripped those suckers out with disregard to their future! Allium schubertii I still adore... they are like fireworks! 10 bulbs multiplied to 50-60? Ha! That's crazy talk. I am a little worried about the clay soil and our wet winters. Sounds like a recipe for rot. I currently have 300ish tulip bulbs in my fridge. I admit to the extravagance of digging them up and tossing them when they are done blooming. I have one variety that has naturalized and I let it stay, though thankfully the foliage on that one dies down really quickly.I love the selection you got and that Amaryllis is fab! And just for the record 4 to 6 inches is my limit unless I'm putting them in a pot. Thanks Beth...as if I wasn't already on edge for spring to arrive...this is another reason to want it NOW! I love John Scheepers and I love bulbs, and I love species tulips! I've grown 'Little Princess', it's definitely worth including in the garden. Cool! Now, the tough part: getting them all planted.